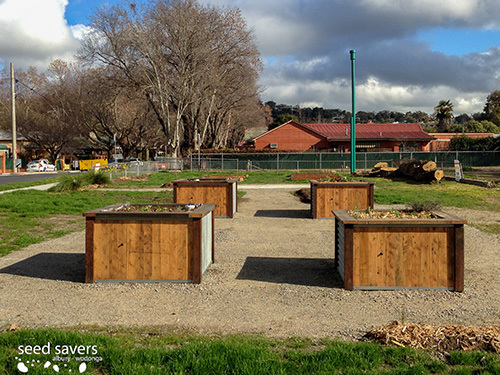 On a superbly sunny winter weekend (August 18 & 19) we constructed four wicking beds on Saturday and returned on Sunday for some planting and the official launch by the Mayor. 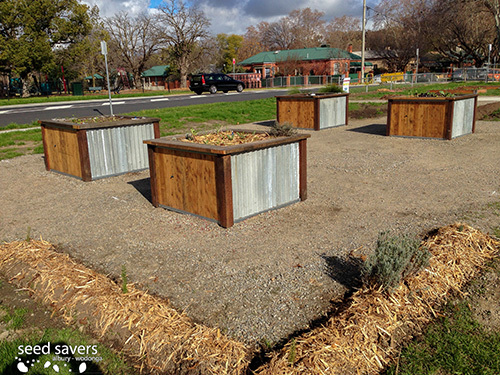 You can read about the background to Seed Savers Albury-Wodonga’s involvement in the wicking bed aspect of this project here. Set up began ahead of the public’s arrival, and with frost still evident on the pile of soil that were pre-delivered. Some keen gardeners were also out early. The pre-constructed sides, tops and fittings for each bed were laid out, ready for assembly. From the ‘official’ kick off, the four wicking beds took about four hours to put together and fill. 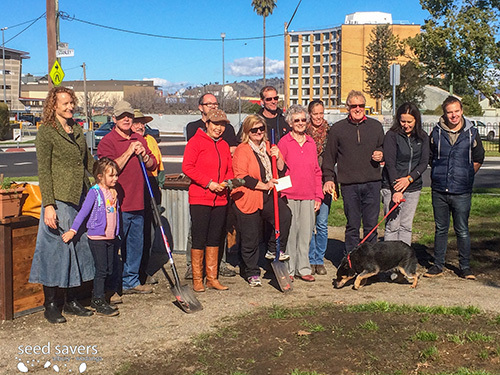 We were grateful for some extra help from some Seed Savers members as well as local residents and community gardeners. Many hands did indeed make for lighter work. 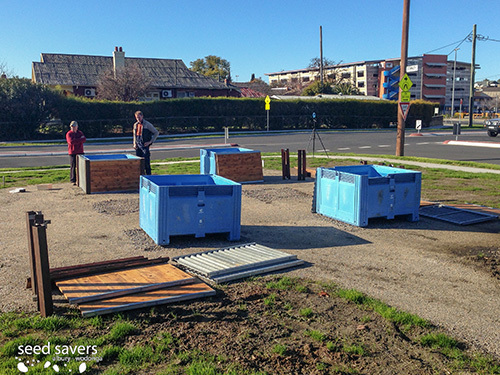 The construction process for these beds was much the same as those at the Women’s Centre a couple of weeks ago (see here), only with more people involved. 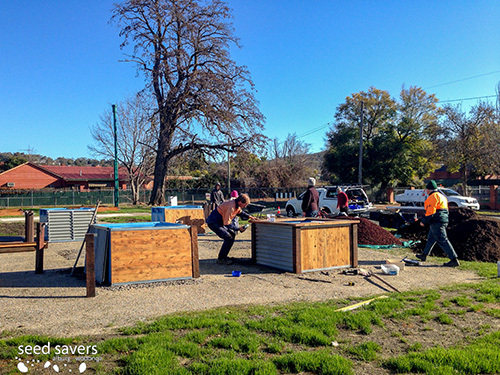 Thanks again to Chep Pallets for their donation of the bins we used as the inners of these beds, and to Peter Costello from Chep for coming along to lend a hand on the weekend as well. We did a lot of talking about wicking beds too, not surprisingly! Hopefully we might see even more of them popping up across Albury-Wodonga as a result. You can access the information handout from the event here. And don’t forget our tip sheets on constructing wicking beds and also for growing in wicking beds. Our guess is that over 100 people joined in across the weekend. 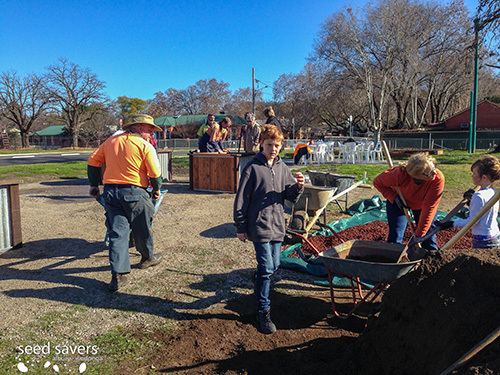 Many lent a hand with the construction or planting, some came just to check it out and others helped to munch some snags and put their hands together at Sunday’s launch of the garden. As well as the wicking beds, other beds and spaces on the site are also being ‘adopted’ by local gardeners. Donations of a passion fruit vine and peach tree were also planted. 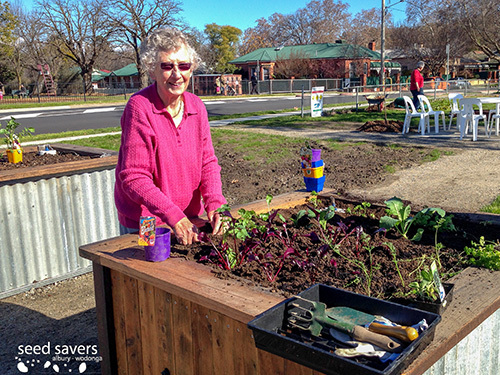 Gardeners, council staff and seed savers; photo by Thea O’Loughlin. 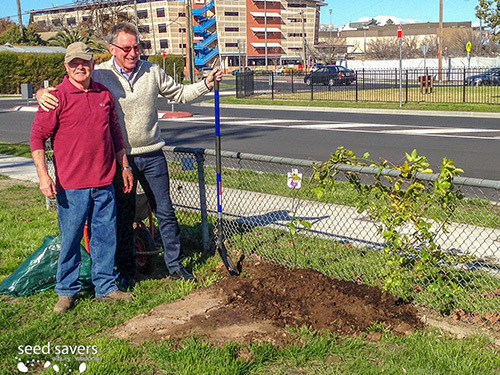 Mayor Kevin Mack and community gardener, Frank, plant a passionfruit to mark the occasion. 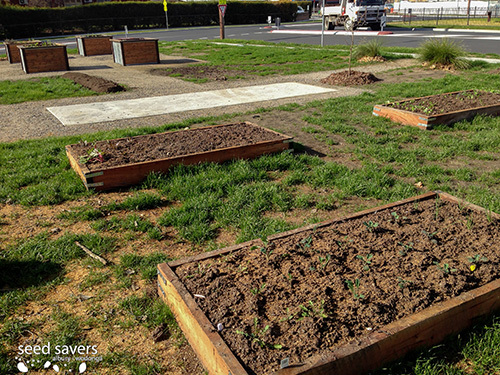 Of the many benefits wicking beds offer, one is that they enable the creation of a garden even on hard surfaces or poor soils. 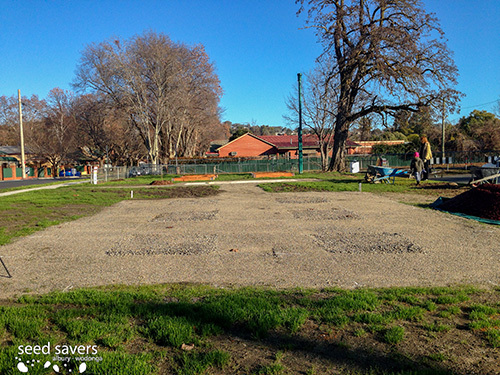 In this situation, the ability to remove the beds (if community interest wanes, or if vandalism is too much of an issue … though there are also some plans in place for this) and even to potentially re-install them in another location is also a bonus. We understand this helped the council decide to support the project. We’d love to see other neighbourhoods hosting similar spaces. While many, but not all, of us have our own gardens, there are additional benefits (and challenges) offered by community gardens. Often the social aspects and opportunities to learn from each other are big draw cards. It’s also a wonderful way to get to know your neighbours and, if you’ll pardon the pun, to cultivate a sense of community. The conversations over the weekend as we built these beds were testament to all of these. 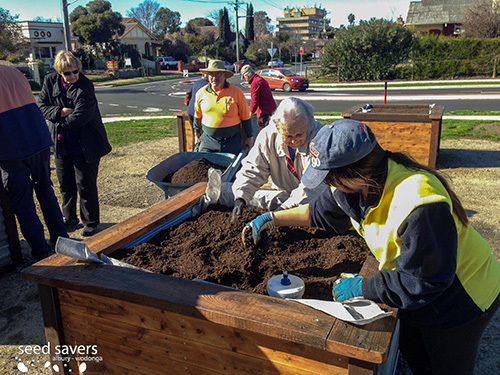 We wish the gardeners all the best for their adventures at Bungam Community Garden and we thank AlburyCity for inviting us to add wicking beds to this exciting public project! (except group image, kindly provided by Thea O’Loughlin; and big thanks to Joanne Diver for the loan of her camera to create the time-lapse). 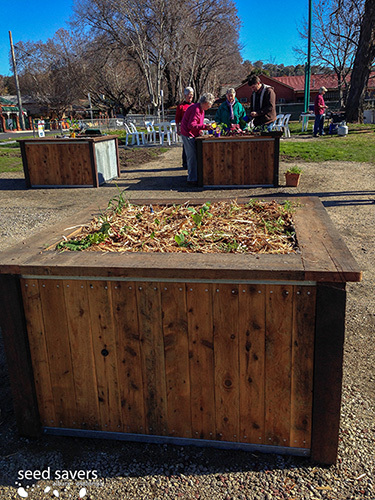 This entry was posted in Event reports and tagged Albury, community gardens, urban food, wicking beds by Seed Savers Albury-Wodonga. Bookmark the permalink.